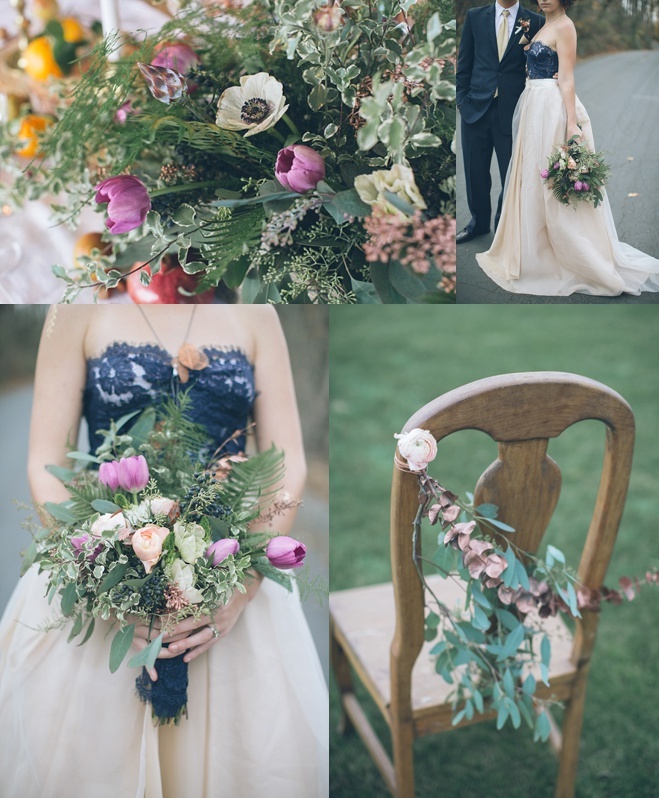 From the antique chest overflowing with local produce, meats, breads, and cheeses, to the soft, understated floral design cradled in vintage copper pitchers, this shoot is overflowing with organic beauty. Natural accents like wood cookies and a smattering of nuts and fruit paired with rustic gold candeholders a muted, foliage-filled floral centerpiece liven up an otherwise spare wood table accented with a simple white table runner. Custom offbeat gowns complement the asthetic and infuse the overall feel with a dose of modernity. 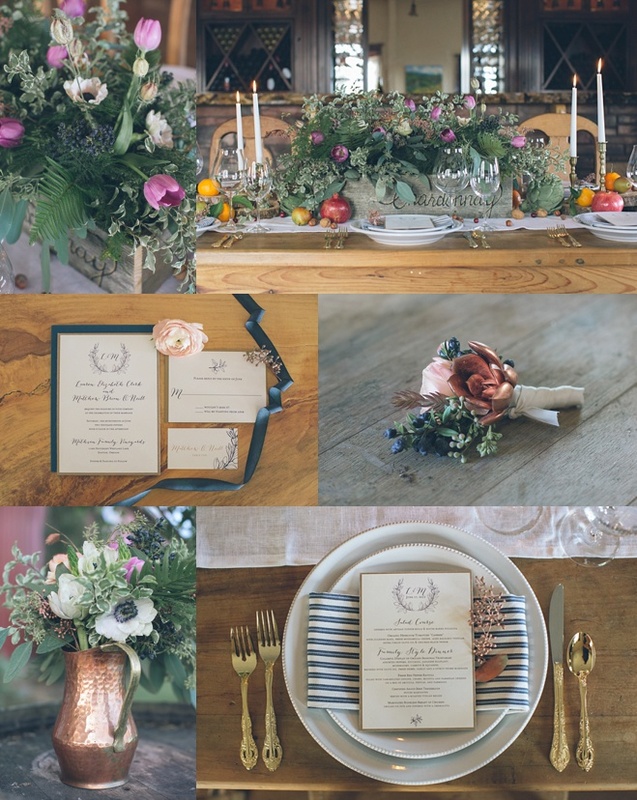 Keep scrolling to get inspired and to read what the coordinator, Queen Bee Home & Event Design, had to say about the inspiration behind this sumptuous farm-to-table dream. "Living in the Portland area is always inspiring. 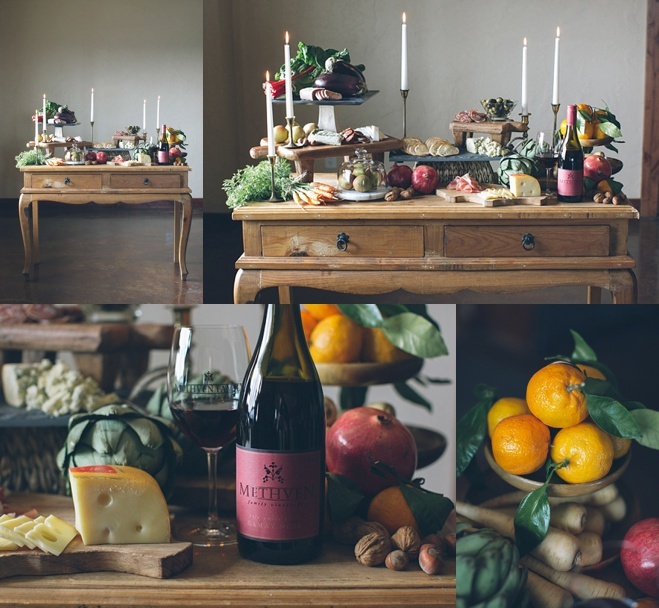 The colors of market foods, tastes of rich red wines, and views of our branchy vines in the vineyard were the starting point of what I wanted to incorporate into this shoot. From there, Lane' Bigsby (Something Borrowed Vintage Rentals) and I agreed that soft metallics like brass and copper would look amazing next to our textural setting. And so began our industrial farm-to-table visions. I knew great food and wine had to be integrated, so choosing the perfect caterer was essential. I was immediately drawn to the amazing displays that White Pepper Catering puts together, and how simple things like nuts and carrots created such amazing visual depth. 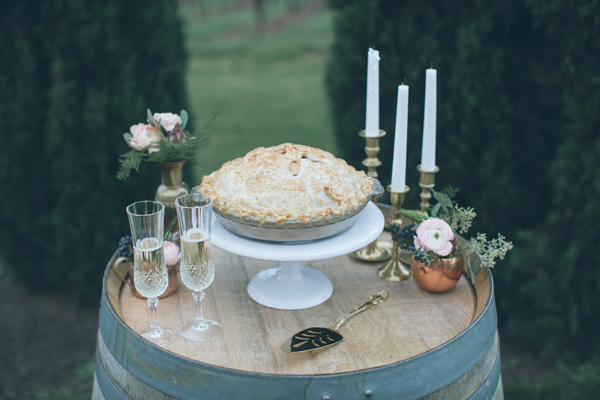 They did a great job on creating a bountiful look, and made us that amazing looking pie for our dessert barrel! Bramble Floral was an easy choice, we wanted something less structured but with new and creative accents. I made the floral box on the table with the word "Chardonnay" thinking it would be such a fun way to label tables, rather than your typical numbers. Alli did a great job filling them with various greens, simple blush ranunculus, and white anemones. The added copper leafy branches were my favorite. The Nature Of Isa has some great gown designs. 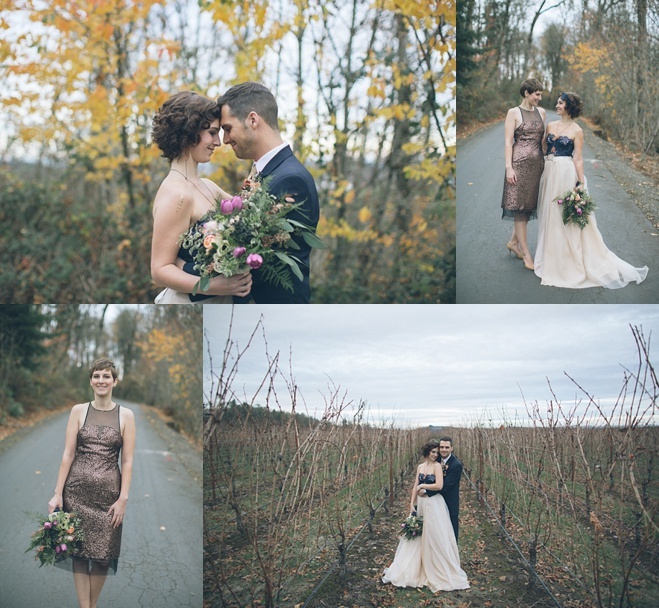 Simple, elegant and natural, which is exactly what we wanted for this shoot. I loved her use of color and how she kept with our theme, even making copper jewelry just for us! The fact that she made something so atypical was perfect. And you can't beat having a designer who is able to model her own designs! She also made the "bridesmaid" dress that Alli from Bramble so humbly sported. Our grooms attire was provided by Mr. Formal, a navy blue suit chosen based on its simple clean lines and sleek look. 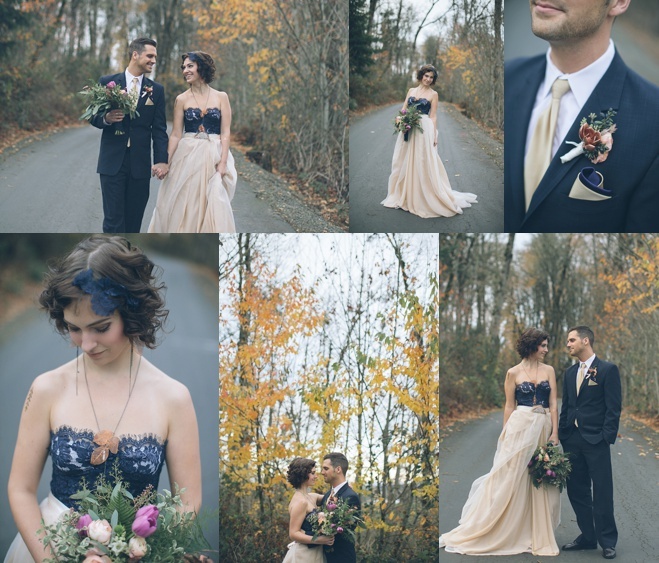 I chose a soft gold tie and pocket square to match our bride, and Bramble created an beautiful copper boutonnière. Lane' from Something Borrowed is a miracle worker, and I trusted her to see my vision and run with it. 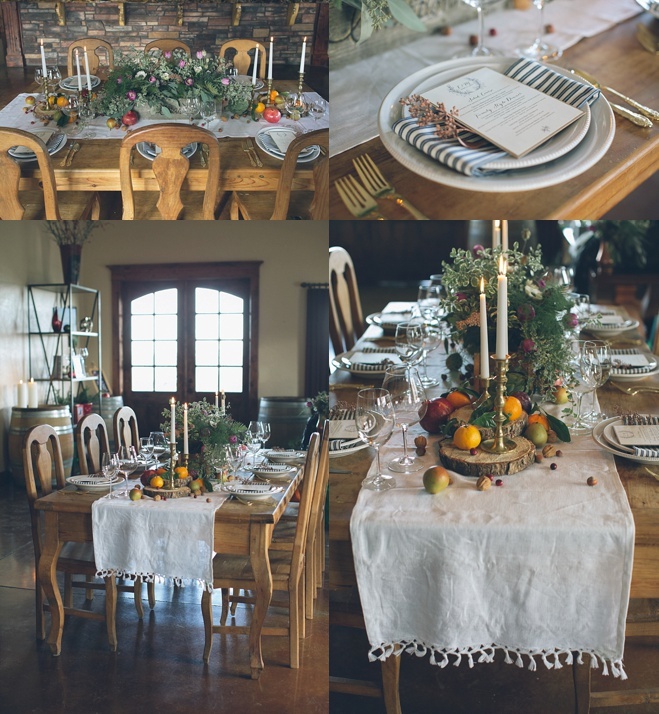 She used our tables from Methven Family Vineyards, and dressed them up to perfection with minimal linens and the menus provided by The Card Bar. The floral, candles and fresh fruit she added created the most delicious looking backdrop for White Pepper's plated dinner. 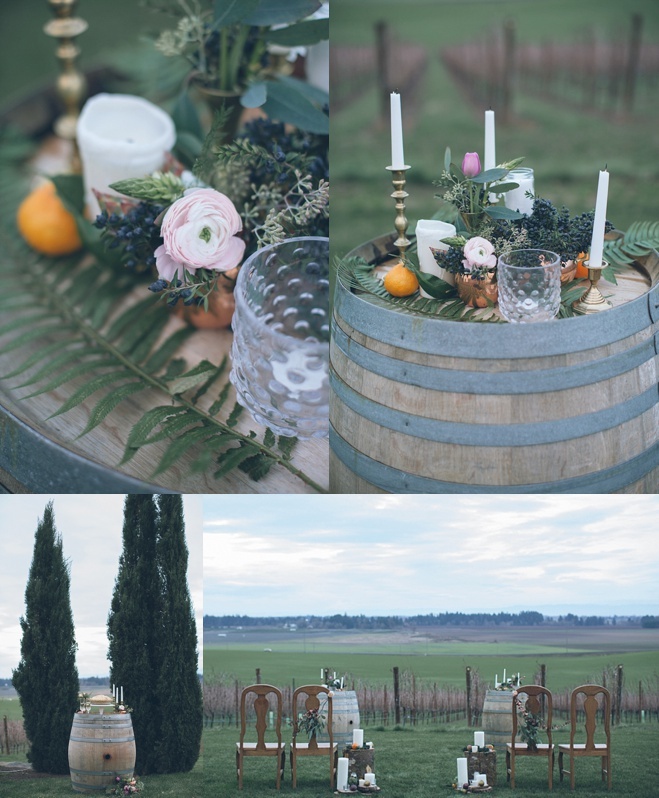 Lane' and I worked on the ceremony together, keeping it simple with our wine barrels, her wood stumps and coins, and plenty of candles of course. 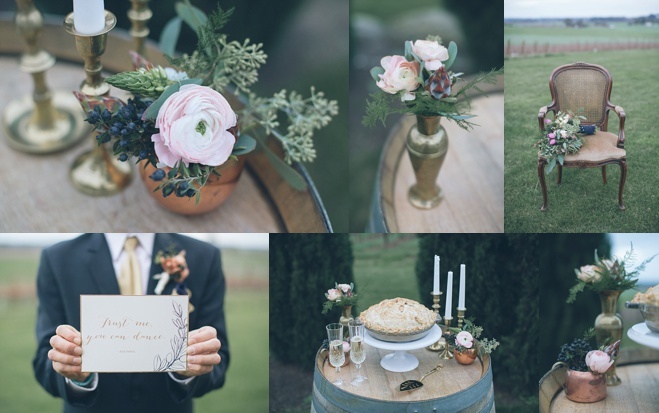 I think the floral that Bramble filled the copper and brass vessels provided by Something Borrowed really brightened the space up." We did a double take when we first saw this bright and bubbly, edgy and urban reception dreamed up by the event planners at The Indigo Bride, based in Bend.